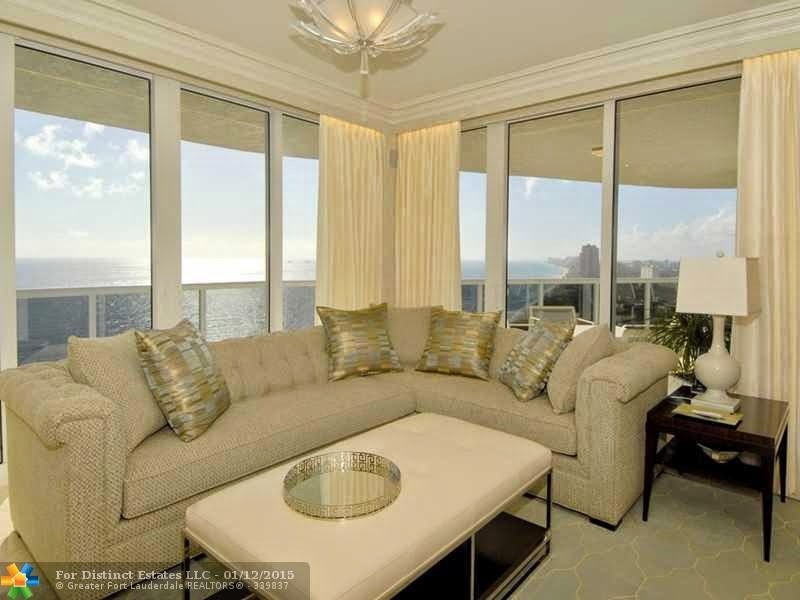 Capturing spectacular views of the Atlantic from the 22nd floor of L'Hermitage II within the highly desirable condo community of L'Hermitage is this newly listed 4BR/4BA Fort Lauderdale condo. Elegantly appointed, this stunning oceanfront condo was meticulously designed to deliver five-star luxury and jaw-dropping views throughout all 3,000 square feet of its luxurious living space. Upon entering this SE corner unit via private elevator, you are immediately greeted by its light and bright open interior and floor-to-ceiling ocean views pouring in through walls of windows. The newly upgraded kitchen is a delight featuring a prep-island, modern cabinetry and full suite of top-of-the-line appliances. Generously proportioned bedrooms boast captivating views and spa-quality bathrooms. The pièce de résistance of this modern masterpiece is, without a doubt, the private wrap-around balcony showcasing a panorama of ocean and city views. Other luxuries featured throughout this L'Hermitage gem include marble flooring, designer lighting and custom built-ins. The exquisite furnishings are also available. 3200 N Ocean Blvd # A 2310 is located in Fort Lauderdale, Florida and is currently asking $4,000,000. This L Hermitage listing is courtesy of Post And Post, Inc. MLS# F1321583 . Uniquely situated on 10 private acres of meticulously landscaped oceanfront property, L'Hermitage is a luxury condominium community located in Fort Lauderdale, Florida. In addition an enviable Fort Lauderdale address, residents of the L'Hermitage also indulge in a number of resort-style amenities including 24/7 security, valet and garage parking, 2.5 acre tropical pool deck with two heated pools and spas, poolside café, private cabanas, 24/7 state-of-the-art fitness center with saunas and showers, sports lounge with Wi-Fi access, card room and tennis center with two lighted soft courts. Conveniently located east of US-1 and A1A, L'Hermitage residents don't have to travel far to enjoy the best of Fort Lauderdale. Waterfront restaurants, world-class shopping, popular nightspots and a wide array of cultural options are all just minutes away.